Browse: Home / drozer v2.4.0 is a comprehensive security audit and attack framework for Android. drozer v2.4.0 is a comprehensive security audit and attack framework for Android. drozer allows you to search for security vulnerabilities in apps and devices by assuming the role of an app and interacting with the Dalvik VM, other apps’ IPC endpoints and the underlying OS. 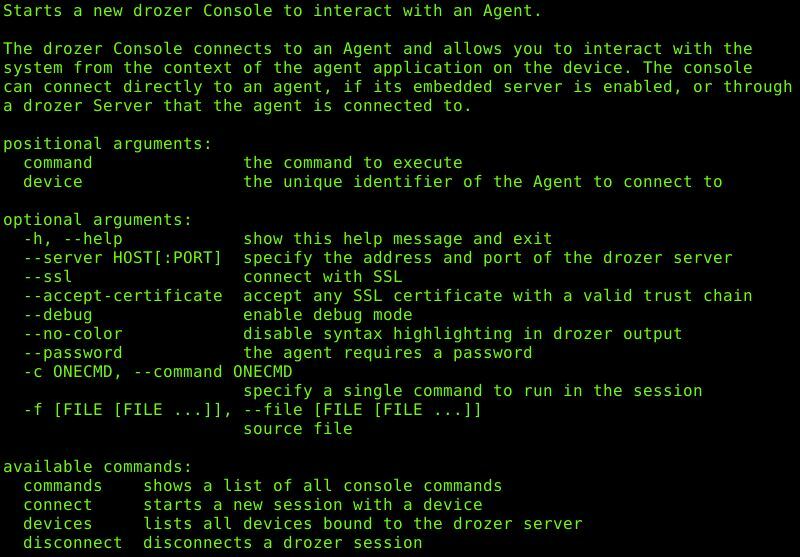 drozer provides tools to help you use, share and understand public Android exploits. It helps you to deploy a drozer Agent to a device through exploitation or social engineering. Using weasel (MWR’s advanced exploitation payload) drozer is able to maximise the permissions available to it by installing a full agent, injecting a limited agent into a running process, or connecting a reverse shell to act as a Remote Access Tool (RAT). drozer helps to provide confidence that Android apps and devices being developed by, or deployed across, your organisation do not pose an unacceptable level of risk. By allowing you to interact with the Dalvik VM, other apps’ IPC endpoints and the underlying OS. 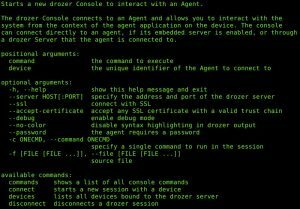 drozer provides tools to help you use and share public exploits for Android. 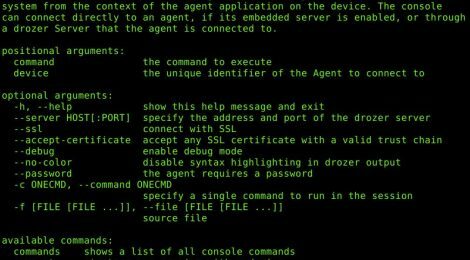 For remote exploits, it can generate shellcode to help you to deploy the drozer Agent as a remote administrator tool, with maximum leverage on the device. drozer helps to reduce the time taken for Android security assessments by automating the tedious and time-consuming. +-+ Discover and interact with the attack surface exposed by Android apps. +-+ Execute dynamic Java-code on a device, to avoid the need to compile and install small test scripts. drozer runs both in Android emulators and on real devices. It does not require USB debugging or other development features to be enabled; so you can perform assessments on devices in their production state to get better results. drozer can be easily extended with additional modules to find, test and exploit other weaknesses; this, combined with scripting possibilities, helps you to automate regression testing for security issues. drozer provides point-and-go implementations of many public Android exploits. You can use these to identify vulnerable devices in your organisation, and to understand the risk that these pose. ← TheFatRat v1.5 codename: Unity – Backdoor Creator For Remote Access.